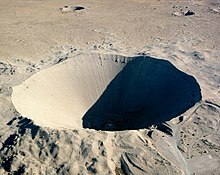 the town of Moronvilliers was totally destroyed in WWI and was also a site for French dry-nuclear testing? though only 14% of all U.S. nuclear testing was conducted at the Pacific Proving Grounds, they comprised nearly 80% of the total explosive yields of all U.S. tests? in 1950 former record-setting balloonist Thomas G. W. Settle was assigned to perform a nuclear test in the Aleutian islands? a congressional reporter mistranscribed testimony about a U.S. nuclear test from 1962 named Sedan nuclear test, leading to fears that a nuclear weapon had actually been tested in the Sudan? a nuclear bomb test that significantly fails to produce its estimated yield is called a fizzle? Preparation for an underground nuclear test at the Nevada Test Site in the 1980s. Visible in the photograph are the test monitoring equipment, as well as the subsidence craters created by previous underground nuclear tests. Four major types of nuclear testing: 1. atmospheric, 2. underground, 3. exoatmospheric, and 4. underwater. 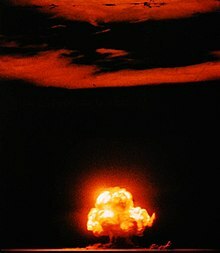 The first nuclear test, "Trinity", took place on July 16, 1945. Because of concerns about worldwide fallout levels, the Partial Test Ban Treaty was signed in 1963. 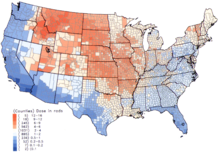 Above are the per capita thyroid doses (in rads) in the continental United States resulting from all exposure routes from all atmospheric nuclear tests conducted at the Nevada Test Site from 1951-1962. Over 2,000 nuclear explosions have been conducted, in over a dozen different sites around the world.